UBC-Vancouver’s Teaching and Learning Enhancement Fund (TLEF) was created in 1991 to enrich student learning by supporting innovative and effective educational enhancements. Starting in the 2017/2018 cycle, a priority focus on the development or integration of open educational resources (OER) was added to the criteria for new proposals. Furthermore, eligibility requirements were also added that specifically stated that funded projects are encouraged to openly license their developed materials under an appropriate Creative Commons license to allow for broad sharing within and beyond UBC. Approximately 25% of the 2017/2018 TLEF funded projects had an explicit open strategy. In the 2018/2019 cycle, more than 39 percent of the TLEF funded projects incorporated strategies around open resources or practices. The adoption, adaptation, and creation of OER. OER are teaching, learning, and research resources that are free of access barriers, and which often carry legal permission which allows anyone to freely use, adapt and share the resource. 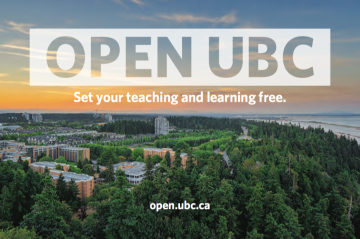 The adoption of open education pedagogies and practices that leverage UBC’s open technologies and OER to allow for flexible, authentic, student-centered, and accessible learning. This project aims to provide French teacher candidates with the necessary skills and resources to effectively create and share resources in alignment with the revised B.C. Curriculum and Digital Literacy Framework. This project aims to increase authentic student learning through the curation, development, and provisioning of openly available multi-media chemical engineering resources. Additionally, students will build upon these educational resources. One objective of the project is to enhance use of an open soil educational resource by embedding open pedagogies that allow authentic knowledge creation and encourage students to connect course content with real-world applications. In this project, faculty and students from across UBC will collaborate to create a comprehensive set of resources to support anatomy education in all UBC programs. The UBC Library will assist faculty in creating, adapting, or adopting open textbooks and OERs. The goal is to produce up to 8 open textbooks across subject disciplines. This project brings together faculty and students from across departments and Faculties to co-create an interdisciplinary, open educational resource on sustainability and environmental ethics. This project proposes to build a new tool, called Tapestry (tapestry-tool.com), that will enable a novel development model for online course content: One that is learner-centered, constructivist, and emphasizes student-faculty co-creation and reusability. Tapestry will allow for the production of interactive, remixable, reusable, and extensible educational modules. Please visit the UBC TLEF site for a complete list of TLEF funded projects. The TLEF is financed through a portion of the student tuition paid to UBC Vancouver. According to the 2016 AMS Student Experience Survey (pdf), nearly 75% of students have not bought a course text due to cost at least once and 37% reported. Access to educational materials is an important topic for students as they often or frequently go without textbooks or resources due to cost. Open educational resources and practices can help close those access barriers. Please note: Open UBC Snapshots attempt to quantify and explore emerging trends in open educational practices at UBC. Please help us make this series more complete. If you are using open resources in your own teaching and learning or are aware of any open practices or adoptions on campus, please let us know! This Open Snapshot was adapted from the TLEF and Open Education Poster presented at the TLEF Showcase. The original poster can be downloaded here.